Hanoi (VNA) – All activities undertaken by the waterways transport in 2016 were aimed to create a breakthrough for the sector toward cheap prices with safety, said an official. 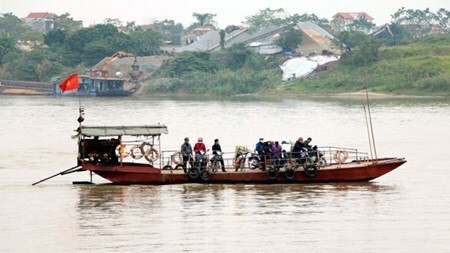 "One of the most notable breakthroughs that the Transport Department recorded in 2015 was the opening of a new North-South coastal line transport – running from northern Quang Ninh province to southern Kien Giang province," Director General of the Transport Department, under the Ministry of Transport, Tran Ngoc Bao, said. In one year of operation, Bao said, more than six million tones of cargo were transported, of which most of the cargo were oversize and overweight. He added that in 2016 his department will do its best to bring into full play the comparative advantages in the inland waterways transport sector. Pham Van Binh, Chairman of the Ha Trung Transport Ldt Company in Nam Dinh province, said his company had five ocean going ships operating in the Quang Ninh-Kien Giang route. Thanks to the low transportation costs compared with road transportation costs, 2015 was a successful year for his company. Reviewing activities of the inland waterways transport in 2015, Hoang Hong Giang, Director of the Vietnam Inland Waterways Administration (VIWA), said some 200,000 tones of cargo were transported – an increase of 9 percent compared with that of the previous year. "What's more, the cost of the inland waterways transport was only about 30 percent of that of road transport," Giang said. In a near future, Giang said, VIWA would open new international waterway routes from Vietnam to Cambodia and China. It is projected that in 2016 and the following years, the Vietnam Inland Waterways Administration will record many more successes following the separation of the State management function with the task of maintenance service. In the long run, Giang said the maintenance service would be tendered in a hope to maintain the maintenance fund and improve the quality of the transport service. According to Giang, in 2015, his department organided more than 100 conferences and inspection visits to help transport enterprises solve their difficulties and challenges in order to create a more amicable atmosphere between State management agencies with enterprises and the general public. "2015 was the first year that the Vietnam Inland Waterways Administration launched a hotline to receive comments/suggestions from enterprises and people to help them improve their services," said Giang.